If you want a smart watch but aren't compelled by the Galaxy Gear or enamored with the Pebble, there are other options out there to sate your desire. One of those options is Sony's Smart Watch 2. 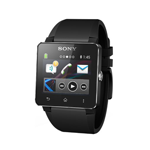 Best Buy is offering the second iteration of Sony's smart watch effort for $159.99, forty dollars off its normal price from the retailer, and thirty dollars off its price at Amazon. With a 1.6" transflective LCD display (which, unlike regular LCD displays, actually reflects and transmits light), IP57-certified water resistance, and a design language reminiscent of Sony's Xperia devices, the Smart Watch 2 isn't a bad choice for those looking to try a wrist-mounted wearable. If you've been waiting for a decent deal on the Smart Watch 2, hit the link below to grab yours from Best Buy.